Ah, recycling. It’s been around forever in one form another, whether back when your grandmother reused glass bottles for canning or in 2014 when a truck comes around to pick up all those empty soda cans you put out at the end of your driveway. But while (most) everyone knows that you can recycle glass bottles, aluminum cans, newspaper, and cardboard, there are many other things that can also be recycled through a variety of methods. By finding the right company to handle your waste, or by implementing a little bit of creativity, you can probably recycle a lot more than you currently do. Let’s take a look at a few items you may not have known were recyclable. That clunker leaking oil in your backyard could be sold for metal or for parts, both of which are excellent alternatives to just letting it rot out back. Alternatively, if your car still runs but it’s not really worth selling, it can be donated to a charity that has a car donation program. Just Google “donate my car” and find a company near you. Did you know you could recycle your old eyeglasses? I didn’t, until I looked into it. (Get it, “looked” into it? Ugh.) Eyeglasses in good condition are sent to medical missions and international charitable organizations for distribution to the poor in developing nations. Lions Clubs and LensCrafters both have recycling programs in place, as do some Walmarts. Get a new iPhone every six months like they try to make you think you need to? Make sure to recycle or sell that old one. There are more than 500 million used cell phones in people’s drawers or in landfills. You can either sell it to a company like Gazelle.com or check out RecycleMyCellPhone.org. which refurbishes your phone for reuse or removes the parts and uses them for other phones. If you have some equipment that is in OK working order, trade it at your local Play It Again Sports to cash or credit towards different gear. You can either donate to Goodwill or trade in/sell your old or unused clothing at Rag-O-Rama. Bring in your clothing to one of their locations and they will give you cash or store credit for them. Everyone has old, broken crayons around that the kids just don’t want to use anymore. Who wants to try to draw a masterpiece using a nub of red crayon? However, don’t throw them away! Instead, recycle them at Crazy Crayons. No, no one is going to use it again silly. But some great environmentally friendly/recyclable toothbrushes can be found in stores, and here are tips on what to do with your not so environmentally friendly ones. Again, no one actually wants those old holey socks. But here’s a great list of innovative things you can do with your old socks. Items including making potpourri holders or sock jump ropes. Check out your local Freecycle.org or Craigslist.org for other people who may want to pick up your boxes so they can use them to move with! So you wore that prom dress once, now what? Let someone else have the best night of their lives, courtesy of The Bella Project. If you are considering chopping all your hair off, don’t let it go to waste. Instead, donate it to an organization that makes wigs for sick children. Have an old Yoga mat lying around the house? Recycleyourmat.com reuses, recycles, or up cycles your mats. You can drop it off at one of their locations or mail it in to them. What do you recycle that would surprise some people? Share in the comments! These are all great ideas! I have three old eyeglasses, an old sock and toothbrush! I didn’t think that it can be useful! Too bad, I just cut off my hair at the salon and I think they only threw it away. The entire family just went in and got our eyes checked, and we recycled all our old eyeglasses. Which is cool because we had no use for them, and they’ll likely go to help someone who needs glasses but is less fortunate. Great post! Locks of Love tends to sell a lot of donated hair to fund itself rather than making it into wigs for patients. I have heard Pantene’s Beautiful Lengths does a better job actually getting wigs made and giving them away, although I think they go to alopecia sufferers, not cancer patients. In my area you can scrap your model year 2000 or older car through a government program and in exchange get a $550 credit good at one of several local carsharing organizations. Pretty cool! Great ideas. 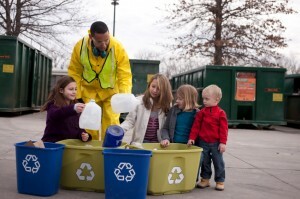 It’s possible to make disposing of old or unneeded stuff a win-win. You can rid yourself of clutter and possibly get something back, the environment can be helped, and in many cases other less fortunate folks can benefit. They all resonate with me, particularly the helping others in need part. No idea crayons could be recycled! I love donating things or trying to find alternative uses for them, even if I’m not the one that gets the use from it. It’s great to be able to help people out, declutter the house, and help the environment all at the same time. Count me as one person with an old cell phone in the drawer. I have never heard of yoga mat recycling and I am pretty sure I have a beat up mat I can donate now! I donate old clothes and use old toothbrushes for cleaning small items. In my village people are building house walls with plastic bottles filled with empty bags of chips so they use less concrete when filling up the walls.